Heat the oil in a medium nonstick pan. Add the shrimp; season with salt and pepper to taste. Cook the shrimp on both sides until cooked, about 3-4 minutes. Remove from pan and let cool. Chop each shrimp into small pieces. Add the onion, garlic, and chorizo to the same pan. Cook, breaking up the chorizo into small pieces with a wooden spoon, until it is no longer pink, about 8 minutes. Remove from the pan, drain, and let cool. In a medium bowl, mix the cream cheese and the Monterey Jack. Add the shrimp and chorizo; mix until fully blended. Stuff the jalapeños with the shrimp and chorizo mixture. Sprinkle more Monterey Jack cheese on top, if you like. Bake for 10–15 minutes, or until the cheese begins to brown. When cutting fresh jalapeños, wear plastic gloves and wash hands thoroughly afterwards. 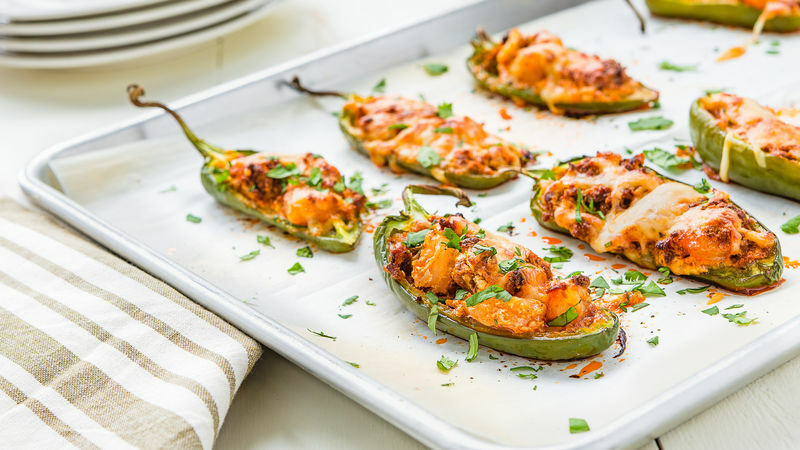 These shrimp and chorizo stuffed jalapeños are really delicious! I'm fairly sensitive to spicy food and generally avoid chili peppers. However, when I made these jalapeños for my husband, their smell was so delicious that I couldn't help but taste them. I guarantee that the amount of heat is just perfect, and the combination of flavors makes these jalapeños unique. I dare you to try them... you'll love them!